Bill Lark, far right, accepts the award for Champion Australian Distiller. 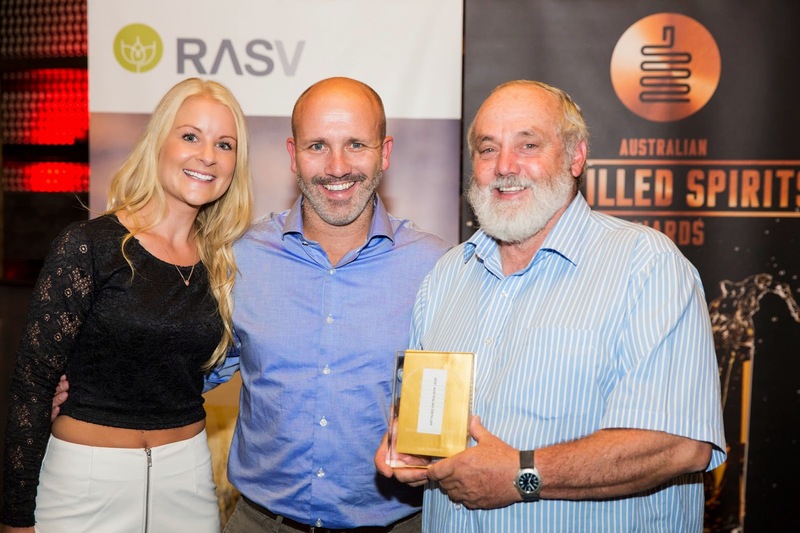 Lark Distillery was last night dubbed Champion Australian Distiller at the Australian Distilled Spirits Award. A spokesperson for the Australian Distilled Spirits Award said The Champion Distiller Trophy acknowledges outstanding achievement in and consistency of distilling excellence. The trophy is awarded to the distiller with the highest average score, calculated on the basis of the distiller’s three top scoring entries. Bill Lark of Lark Distillery said: "It's a proud moment for me, and a wonderful thing to see how we [the industry] are growing and the respect that our industry is gaining overseas. Bars that we once dreamed of being in are now wanting desperately to have more Australian spirits and Melbourne really is the mecca for that. Winning this award is a huge honour and surprise." Western Australian's Great Southern Distillery’s was also lauded for its Limeburners Peated Single Malt Barrel M227, which was awarded Champion Australian Whisky. Two other WA distilleries also took out top tipple awards: The Tailor Made Spirits Company was awarded Champion Australian Gin for The West Winds - The Sabre and Champion Australian Rum went to the Hoochery Distillery’s Spike’s Reserve. The West Winds Gin trophy adds to the impressive treasure trove of medals and awards already amassed by the crew, including Double Gold Medals at San Francisco in 2011 and 2013 for The Cutlass, a Double Gold in New York in 2014 for The Broadside and a Gold for The Sabre at San Francisco in 2011. Locally, The West Winds Gin has collected Champion Gin at the 2014 Royal Melbourne Fine Food awards and the Best On-Premise spirit brand at the 2013 ALIA awards. In the four years since The West Winds Gin team launched their Margaret River based gin on the world, the Australian distilling landscape has developed into a world class act with amazing styles being produced by a range of high quality producers. The West Winds Gin Head of Sales, Booze, and Buccaneering, Jez Spencer says the Sabre tips its hat to the great gin houses of old and is a well-balanced introduction to the London dry styles. All up, seven major trophies were handed out to the country’s top distillers during the official awards ceremony, which was presided over by the panel of industry experts, educators, specialist retailers and bartenders who sipped and sniffed their way through 115 entries at Melbourne Showgrounds last week. The judges also awarded South Australia’s VOK Beverages Champion Trophy for Brandy with its Black Bottle XO Brandy, while Champion Australian Liqueur went to Queensland’s Castle Glen Australia for its Pecan & Hazelnut Liqueur. Victoria also received major trophies, with Edgemill Group’s Zeus Oyzo winning Champion Australian Alternative Spirit. The awards are presented by The Royal Agricultural Society of Victoria and supported by the Australian Distillers Association and designed to acknowledge the changing nature and recent significant growth of the emerging Australian spirits industry.